2008/05/26 – St. Louis, MO – The average North-American spends two to three years of his or her life waiting in line. Sharp Electronics Corporation has partnered with ITC Systems to release a POS terminal aimed to shorten that wait time. Sharp’s new UP-3500 POS cash register system with ITC Systems’ software has been designed to speed up transactions for quick-serve restaurants and cafeterias by integrating the industry’s fastest magnetic card reader. 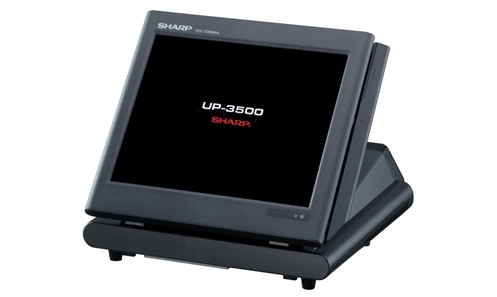 Sharp has designed their newest POS hardware to streamline and simplify the transaction process. Orders processed with the UP-3500 are some of the fastest and most efficient in the industry. “One of the biggest bottlenecks is at the point of sale during the payment process. When you have a cashless system that is seamless you reduce the customer wait times, costly cashier errors are greatly reduced, and time is saved balancing at the end of the day. It is a win-win situation”, adds David Samuel, Product Manager for Sharp Electronics, POS Division.